Universal Credit (UC) was a surprise contender for one of the big stories of the Budget, with the Chancellor announcing a welcome reinjection of cash into the system. UC has (finally) hit another important milestone too ­– as of December 2018, it is on offer to all new claimants of working-age benefits in jobcentres across Britain. 2019 also looks set to be a big year for UC. The new Work and Pensions Secretary Amber Rudd has said that she is willing to listen to and learn from experts as the roll-out continues. A new ‘Make Universal Credit Work’ campaign, launched yesterday by The Sun, will put more pressure on the government to reform the system. Currently 1.4 million families are receiving UC, and this figure will eventually rise to seven million. Ahead of that, what three things could the government do next to build on recent momentum and help restore the reputation of its flagship welfare reform programme? Much of the criticism surrounding Universal Credit revolves around troubles when people first claim. That’s why the government has softened the five-week wait for the first payment by introducing Housing Benefit run-ons and making benefit advances more widely available. However, the government will continue to face calls to further reduce this waiting period and prevent claimants building up debt. These issues have lain behind much of the controversy this autumn relating to the ‘managed migration’ process – in which claimants of legacy benefits are transferred onto UC. In response we have seen welcome steps, including the introduction of ‘run-ons’ of out-of-work benefits to plug gaps in support when moving between the schemes. It has been suggested that the government go even further by extending the ‘run-on’ of existing benefits to tax credits. This is certainly worth exploring, though logistically difficult given differences in how entitlement to tax credits is calculated, and the fact that they are administered by HMRC rather than the Department for Work and Pensions. The government has also delayed the start of managed migration to late 2020, which should provide time to get the transition process right. Our view is that the migration should only go ahead when DWP has been able to increase the share of claims being paid on time and in full. The government should also ensure that it bears the financial risk of any further teething problems. One of the other big challenges for UC has been the undermining of its welcome goal of simplifying the benefits system by its failure to reflect the realities of families’ lives. Two groups of recipients stand out – the self-employed and those with childcare costs. UC requires self-employed recipients to report their income monthly in arrears. In contrast, reporting for tax, and tax credits, is annual. Having two very different reporting requirements (for UC and tax) is obviously a lot of extra hassle for these individuals, but the problem runs deeper than this due to the self-employed minimum income floor (MIF). 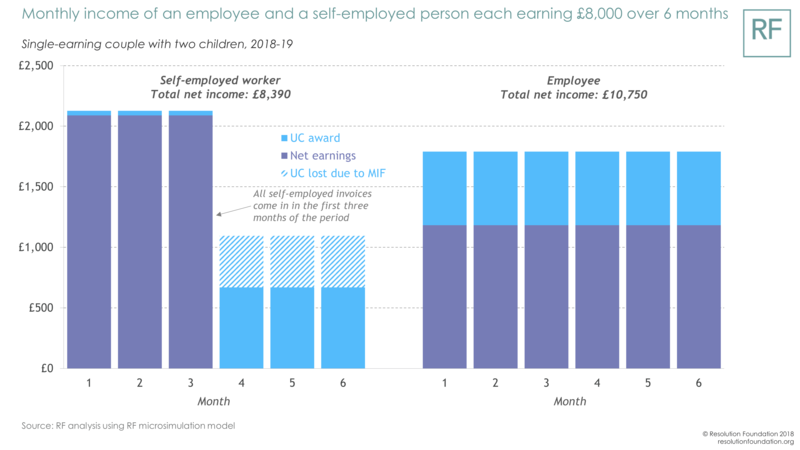 The MIF acts as a cap on UC entitlement in months when an individual’s self-employment income drops below the equivalent of a full-time employee on the wage floor. This is designed to prevent deliberate income under-reporting. However, because self-employed incomes are very likely to fluctuate drastically from month to month, the interaction of monthly reporting requirements with the MIF can leave a self-employed person worse off than an employee with the same annual earnings, as the chart below shows. For these reasons, both the MIF assessment period and reporting requirements on the self-employed should be put on a less frequent basis. The principle of claiming monthly and in arrears creates a similar burden for those with childcare costs. UC provides actually more generous support with childcare costs than the current system. But this welcome improvement risks being undermined by another flaw. Monthly reporting is a poor fit with fluctuating childcare needs within and outside of term times. More importantly, claiming in arrears leaves low-earning parents having to cover the full childcare fee before claiming 85 per cent back. This stands in stark contrast to the Tax-Free Childcare system for better-off parents, in which the government provides matched support up front. Moving childcare support within UC in line with this more flexible approach would mean a less burdensome system for the roughly 400,000 families likely to claim support for childcare costs within UC. And it’s something of a free gift – costing the government nothing in the long run. Work and Pensions Secretary Amber Rudd has acknowledged that UC needs to work better for single parents. One key way to do so is to improve their incentives to enter and progress in work. Our recent analysis has highlighted the risk that single parents will reduce their working. Research shows that they have been among the most responsive to financial work incentives, so it is essential that UC is designed to support them. To do this the government should boost the work allowance for single parents to the equivalent of at least 15 hours on the wage floor. This move, costing £1.3 billion, would benefit around a million single parents by up to £240 a year if they own, and by up to £1,900 for the majority who rent. The other group of workers who are responsive to work incentives are second earners. However, they too are poorly served by UC as benefits are reduced by 63p from the very first £1 they earn. Introducing a second earner work allowance – equivalent to seven hours on the wage floor – would boost the income of a dual-earning couple with children by £1,900 per year (at a cost of £1 billion). The gains could be widespread too – helping up to 1.9 million potential second earners (only 600,000 of whom currently work). Taken together, these reforms would make the system more female-friendly. And they are a more cost-effective and targeted way to support work than slashing the taper rate (for example, a reduction to 50 per cent would cost around £6.4 billion). Such an investment has much more diffuse effects because it provides a boost to most earners in UC and brings many more middle-income families into the scheme. While 2019 is set to be dominated by Brexit, Universal Credit will inevitably take the limelight at some point as ever more families move onto the scheme. With sensible reforms, the government can help to restore its reputation, and show that it is a vehicle for driving up employment, boosting pay and driving down poverty in 21st century Britain.